Since Under the Stairs presents us with two worlds, the rotating staircase by set designer Teresa Przybylski works magnificently. One side reveals the stairs and the closed closet door, offering us the real world of bickering parents, and a quick spin gives us the coat sleeves and fantastical friends. A touch of whimsy is added when more jackets descend from the ceiling. One highlight was a dynamic song with the refrain “Keep up, Violet” in which Sauder re-enacts her character’s life at 8 years old. It’s remarkable to watch her play chess, piano, soccer and cello, squeeze in a yogic tree pose, all while being pulled by one arm by her mother, and her other arm by her father. As the pace quickens and she eventually fumbles her moves, we’re comically reminded of the folly of over-scheduling our children. Hats off to Sauder for her energy and vulnerability, and to Movement Director Viv Moore for the inventive, funny gestures. When the young team ventures out into the city to locate Tim’s parents, the flashing lights by Michelle Ramsay do a great job of evoking the scariness of being in strange places. As far as costumes go, Mum (Neema Bickersteth) wears an eye-catching dress made of crumpled notes towards the end of the play. She has started and stopped so many letters to her husband that she’s weighted down by unspoken words. The broken down communications of her marriage are indeed sewn into this dress, creatively designed by Anna Treusch. I highly recommend bringing your kids to see this world premiere of Under the Stairs. 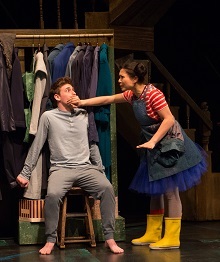 Written with warmth, love and humour, it’s a play that bring children’s vulnerability to light and can start conversations about family friction. Previous PostReview: The Shimmering Verge (Prairie Fire, Please)Next PostPlaylistings for the Week of April 8th, 2019.